White silk inscribed Japanese flag. These flags were given to Japanese soldiers during World War II. Carried for good luck, the flags were adorned with patriotic phrases by family and friends. Allied soldiers in the Pacific Theater often captured the flags and brought them home as trophies. 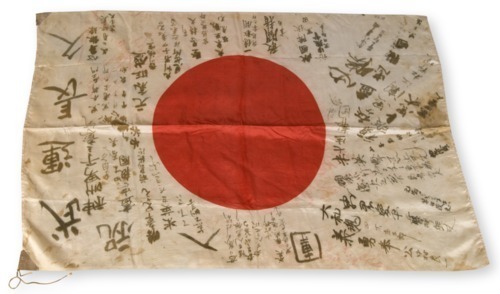 Markings indicate this flag belonged to a Japanese Naval officer stationed at Nanjing, China, and Kure Naval Base, Japan. The flag was acquired in Leyte, Philippines, site of a major battle between Japanese and Allied forces in 1944.